The Sterling currency keyboard, with the rightmost column limited to the keys 1 to 9, instead of the 1 to 11 in a fully keyed model. Illustrated is a semi full-keyboard direct action keyboard calculator of the "comptometer" type with a keyboard for Sterling currency calculations (model SUMLOCK 912/S/4AH/120.260, made by Bell Punch Co. Ltd. in Britain, distributed by Sumlock Ltd., both owned by Control Systems Ltd.). 330 mm x 315 mm x 135 mm (13" x 12.5" x 5.5"), 7 Kg (15.5 lbs). 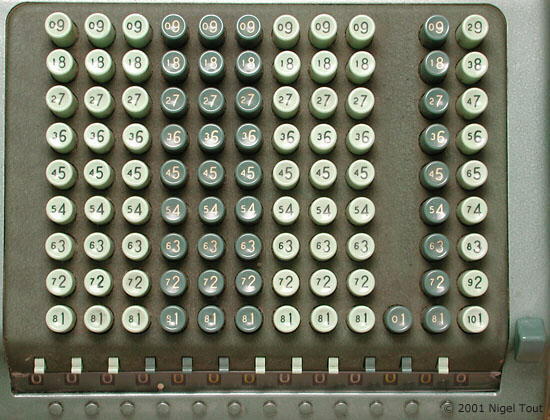 This machine has a full keyboard except for the Pence column where there are only 9 keys (1-9) instead of 11 in a fully keyed model, although the accumulator for this column will display up to 11. The tens of shillings column only has the one key necessary. To enter 11 in this column the operator has to press in turn the (5) key and the (6) key. This plays off ease of use compared with lower manufacturing cost in that more standard components can be used. The machine in the photograph displays the total of £1,500/17s/11d. For information about the Bell Punch company and its calculators see the article on this site "Anita: the world's first electronic desktop calculator - A brief history of the complex Bell Punch company and its calculators". For a detailed history of the development of the Bell Punch and Anita calculators go to the associated site "Bell Punch Company and the Anita Calculators". There are instructions for the basic use of Comptometer-type machines in the article "Operating a Comptometer" on this site. Click here for more information about Comptometers.